Many aspects of both grape production and winemaking influence wine sensory properties and stability. Progress in research helps to elucidate the scientific basis of quality variation in wine and suggest changes in viticulture and oenology practices. The two volumes of Managing wine quality review developments of importance to wine producers, researchers, and students. The focus is on recent studies, advanced methods and likely future technologies. The first volume Viticulture and wine quality opens with chapters reviewing current understanding of wine aroma, colour, taste and mouthfeel. Part two focuses on the measurement of grape and wine properties. Topics covered include instrumental analysis of grape, must and wine, sensory evaluation and wine authenticity and traceability. The effects of viticulture technologies on grape composition and wine quality attributes are the subject of part three. Terroir, viticultural and vineyard management practices, fungal contaminants and grape processing equipment are among the areas discussed. 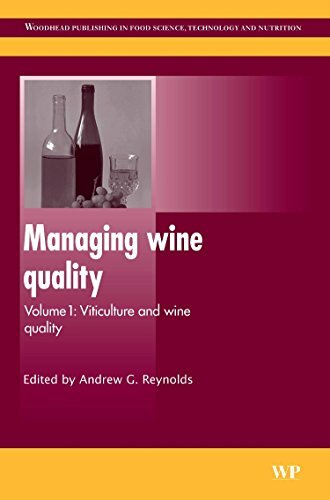 With authoritative contributions from experts across the world’s winemaking regions, Managing wine quality: Volume1: Oenology and wine quality is an essential reference for all those involved in viticulture and oenology wanting to explore new methods, understand different approaches and refine existing practices.